29 April 2010, at 12:51a.m. IRAQ - The Ross distributor in Iraq, Rasun (part of the Vano Group), recently organised two more successful customer events. The first of these was a feed formulation training course in association with the Iraq Poultry Producers Association (IPPA) and the College of Agriculture at the University of Salahaddin, while the other was a parent stock video conference, held in Amman but relayed direct to Erbil. The two-day training course on feed formulation attracted 21 participants from five Iraqi provinces and focussed on the best techniques for feed formulation. Dr Alrawi, Executive Director of IPPA, opened the session, stressing the importance of communication among everyone present to ensure best practice is adopted at all levels and quality continuously improved. On the first day of the seminar, the focus was on the principles of feed formulation and feed ingredients. 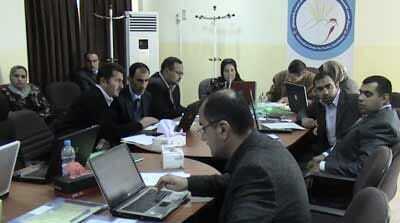 On the second day, training and discussions were held on the testing of formulated feed. Mugdad Muhi Alddin, Manager of Rasun Grand Parent Project, led a well received training session in the afternoon on how to formulate the most cost effective rations. Dr Alrawi expressed his thanks to Dr Salah Mustafa Bakir, Director General of the Vano Group, and Mr Alddin for their help during the event, saying: "The expertise the Vano Group brings to these events is invaluable and we are very pleased to have had them at our event. We hope to have another such scientific meeting in the future for the benefit of all related people working in poultry industry in Iraq." The video conference in Amman reached out to 39 participants, representing seven Iraqi provinces, and included presentations by the Ross Middle East Team on Parent Stock Management. Dr Rik van den Bos, Ross veterinarian, updated the participants on health issues in the region. Marcus Kenny, nutritionist, highlighted the importance of good nutrition and its effects on product performance, and Waleed El Deeb, Technical Service Manager, gave useful tips for management at critical points during the growth period. This video conference is part of a regular series of such events and more are planned in the future. John Maguire, Ross Sales Manager for the Middle East and Africa, commented: "We are very pleased to be working with the Vano Group and Rasun on their regular customer events and would like to congratulate them on their excellent customer service and technical transfer. The success of the Ross product in the market is due not only to its genetic potential but also, in no small measure, to the effective cooperation between the Ross and Rasun teams in ensuring customers at breeder and broiler level are receiving up-to-date, relevant and consistent advice and support. The Ross Middle East team would also like to extend its gratitude and appreciation to Joe O'Brien, Regional Director of the US Grain Council, together with his staff in their offices in Amman for all their continued support and assistance for allowing us to use their facilities and for making these video conference seminars between Amman and Erbil possible."